Ron Threadgill, at the young age of 14, decided that he wanted to drive a hearse. This was the result of passing a funeral home each day walking to and from high school in Napa, California and seeing the hearse in the driveway. At the age of 41 in Portland, Oregon, while attending the funeral of a friend’s father, Ron rode to the service as a passenger ‘in the front seat’ of the hearse. The apparent excitement was so obvious to the funeral director that Ron was allowed to drive the hearse from the funeral to the cemetery! Since 1997 Ron has envisioned one day owning and operating his own hearse. 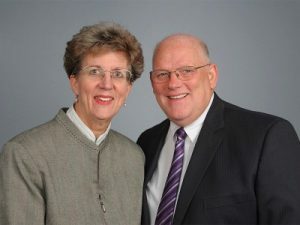 In 1999 Ron & Deborah entered the Funeral Industry as co-owners of a Funeral Home in Portland, Oregon and he has had the opportunity to drive a Hearse several times, and each has been fulfilling. In 2016, wanting to increase the mobility of their son, who is on the Autism Spectrum, Ron & Deborah started looking at scooters and mopeds. Because of their son’s limitations, it was important to help him learn how to navigate traffic and get from location to location. Thus, both father and son purchased 2014 Honda Forza 300 cc scooters. Ron got his motorcycle endorsement and the passion was ignited! Several people told Ron he would want to upgrade, which he adamantly denied for the first 30 days. However, he was already checking out the Harley-Davidsons and was waiting for the right time to pop the question to Deborah. Long discussions ensued and it was determined that unless it was business related, there would be no Harley-Davidson in his future. So in June 2016, Ron, with the assistance of Google, discovered motorcycle hearses. One website, Tombstone Trike and Hearse Company, out of Tombstone, Arizona, caught his attention. He loved the history of the company and the fact that their hearse was built to resemble the Abraham Lincoln Hearse that President Lincoln was transported in from the funeral to the cemetery. 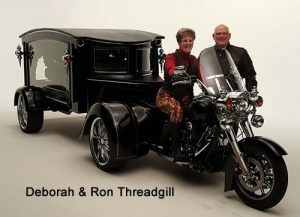 Also, the fact that each trike and hearse is custom made and comes as a unit.